Specifications: Same as above but electrically operated, to raise and drop the table top, approx. 15 times in 15 seconds. Suitable for operation on 230 Volts, 50 cycles, AC supply. Specifications : same as above but electrically operated, to raise and drop the table top, approx. 15 times in 15 seconds. Suitable for operation on 230 volts, 50 cycles, A.C. Supply. 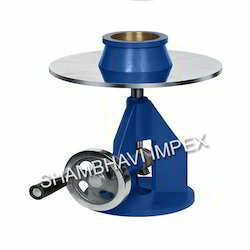 We are leading supplier and exporter of Flow Table Motorised. Supplied complete with an electric motor suitable for operation on 230 volts, 50 cycles, single phase A.C. supply. The flow table test or flow test, also known as the slump-flow test, is a method to determine consistency of fresh concrete. 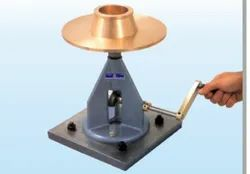 Flow table test is also used to identify transportable moisture limit of solid bulk cargoes. We are one-step ahead of our competitors in manufacturing and supplying a wide array of flow tables. These are basically a multi-purpose tables widely used for determining the concrete cement flow. Following the exact requirements of clients, we provide these flow tables in both hand operated and electrically operated types.